Welcome to October!! Did you see my amazing news? Also, it's interesting to note that my counter (on the left sidebar) is PERILOUSLY CLOSE to going over 500K!! But do it at the Doctor's office and it's freak out city! We have been having just an amazing bout of beautiful weather up here. Every morning is crisp and chilly, but by afternoon the sun is hot and the air has that "Autumn" feeling that i love so much. Chewie and i made these awesome cookies, and the house smelled so great!! I took this picture of this ladybug outside in my front lawn. B-rad was mowing the lawn and upsetting a giant herd of bugs who were busy trying to bunker down for winter.... sorry ladies. Weekly Challenge #89: UMT v. IX: "Sankegg"
Back in June, B-rad and i had the most amazing opportunity to see Roger Waters perform The Wall in concert. We had to travel to Edmonton to see it (one province over, about 6 hours by car). 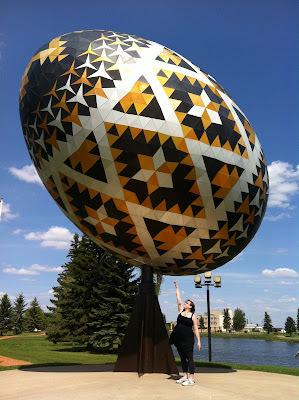 On our way home, we stopped off the highway to see the world's largest Pysanka Egg! I posted about it here and wondered aloud if anyone wanted to try to figure out the Y pattern on the Egg. 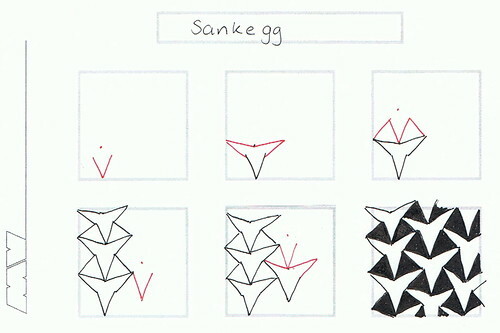 Not a day later, i received an email from Maria Vennekens, CZT from the Netherlands with breakout instructions for the tangle she named Sankegg. Maria doesn't have a blog, so i added her tangle to the UMT list for her. I was so thrilled to see it pop up when i randomly selected this month's tangle!! Congratulations on getting help with the slideshow. We all appreciate the work and time that go into all of this. 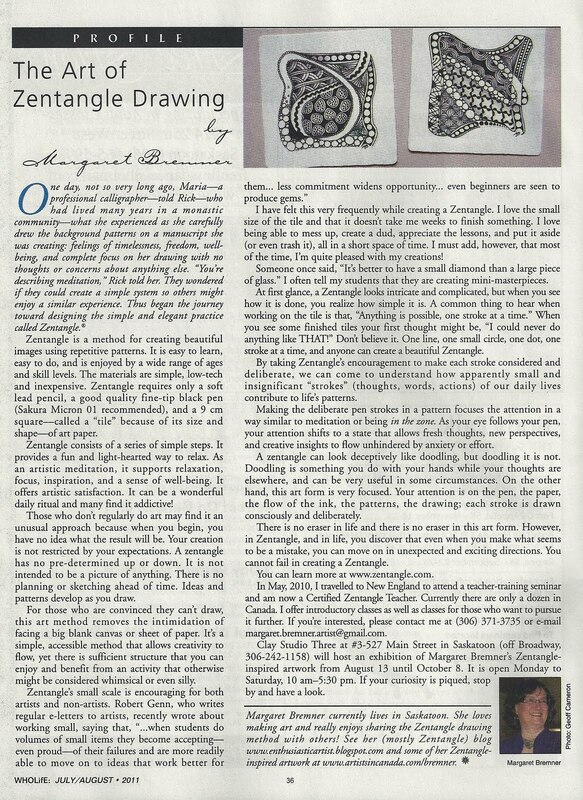 Thank you for inspiring us--through Zentangle and your life! What a great tangle this is. I had such a great time playing with it and deciding how to fill in my triangles. You know, sometimes there is a tangle that just doesn't work for you.... and this is one of those for me. I cannot get the angles right and it looks a right mess. I love the look on your picture of the egg, but I'm afraid that I might have to pass on this challenge unless with more practice I can figure out another way of putting this together. :( Maybe I'll be inspired by others creations and for once I'm going to peek before I even attempt it. Ok, I think I figured it out.... if anyone else is having trouble, I would encourage you to keep trying - it's a neat tangle. Thanks Laura. Thanks! This was a difficult one. I was informed that the original url had a problem and resulted in an error message. I reposted and hopefully that will remedy it. to avoid, use the 21 posting and not the 16. Sorry for the inconvenience. #22 Sorry for the inconvenience. The UMT challenge kept me wide awake and attentive during my UMA conferences this week and I am so grateful for the challenge! Laura, I hope that your are all doing well as the week progresses! Sorry for the first wrong link....my internet service is really acting wonky! Love this pattern, so much opportunities. Truly a challenge this week - I needed that! This was a tough challenge! And reading the (previous) comments here, I'm feeling better knowing that I was not alone in my 'challenge'. Thanks Laura.... and Maria. Hi ! I am from France where I fall for your tangle challenge ! There's not such activities like this in France. The nearest is at Belgium - so far for me... So I do your challenge and I enjoy it. Thanks a lot. Big kisses. Hope this makes it in time for the challenge as I needed time to try it many times over before I put it to your challenge. I really goofed this time! I had this done early last week and forgot to enter it! Hope not too late! !